This Halloween weekend I got to celebrate in the usual ways, such as handing out candy and carving a pumpkin. 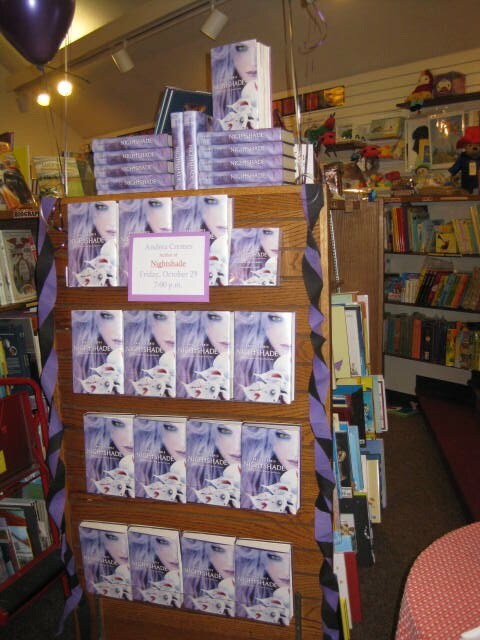 However, on Friday October 29th, the release party for Andrea Cremer's debut novel Nightshade was held at Red Balloon Bookshop in Saint Paul. It also doubled as a costume contest, so I went in costume as the Mad Hatter. me a big hug. After I paid for my books I got to hang out with and talk to Andrea for a couple of minutes for the event started. She is extremely bubbly and energetic, not to mention very sweet, and came in costume as the Morrigan, who is apparently the Celtic war goddess. Eventually, it was time for the event to start. Andrea talked about how the novel was born and read a short excerpt aloud from chapter two. She also introduced her editor, Jill, who had come all the way from New York, and special guest Shay Doran (whose real name is Will) who came in from Florida. After that, Andrea signed tons of books, and there was delicious Nightshade cake. Shay also announced the winner of the costume contest, and he picked me! I won a gift card and a Red Balloon Tote Bag. After this point I also got a chance to talk to Shay/Will and get a picture with him. I made him break character because I was really curious as to how he had gotten into this gig. I felt much less guilty, however, because Jill was also curious to hear the story. Will told us about how he had tried to get a hair cut shortly before the audition but hadn't been able to get in, and how he went to the open call, auditioned and found out he got the role a few days later. This was probably one of the most fun signings I've been to this year! It was lots of fun to meet Andrea and so many people involved with the publication and promotion of Nightshade. I enjoyed this book so much, in fact, that I had Andrea sign a copy for me to give away to one lucky winner. Want to be entered? Just fill out the form below. *One winner will receive a signed copy of Nightshade by Andrea Cremer. *Open to the U.S. only. I apologize, international readers! *The giveaway ends at 11:59 p.m. on November 20th. This looks like a really great time! I want to go to a signing that serves cake!! That is so epic that you got to hang out with all of them and chat. I love having extra time to talk with the authors and get to know them! Thanks for sharing! Wow, so glad you had the chance to go to this. Congrats on winning the costume contest! I have a Mad Hatter costume too, but it's pretty "dark". That is so awesome! Andrea seems like such a fun sweet person. It definitely looks like you had a lot of fun. Love the Mad Hatter look! Looks like you had a lot of fun. Andrea sound awesome. Amazing pictures - thanks for the great giveaway! I can't wait to read this one!! Looks like it was alot of fun! great giveaway thank you very much.